Fiber OneShot Pro works on single mode optical fiber to find high loss connections and the end of the fiber. It provides more information than a simple Visual Fault Locator (VFL), but is typically faster and easier to use than an Optical Time Domain Reflectometer (OTDR). 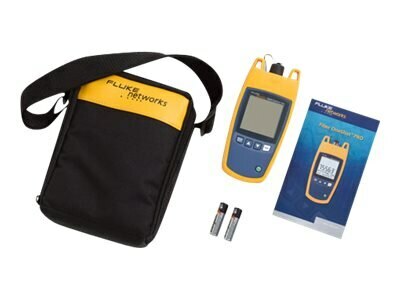 This model includes; single mode fiber fault locator unit, screw on interchangeable SC adapter, UPC-UPC 2-meter patch cord, carrying case, 4-language Quick Reference Guide (manuals in 9 languages available on-line), safety instruction manual, and batteries. SimpliFiber Pro optical power meter and SC adapter are also included.